Since early January there had been rumors that Endomondo, the training log app and website was being sold. 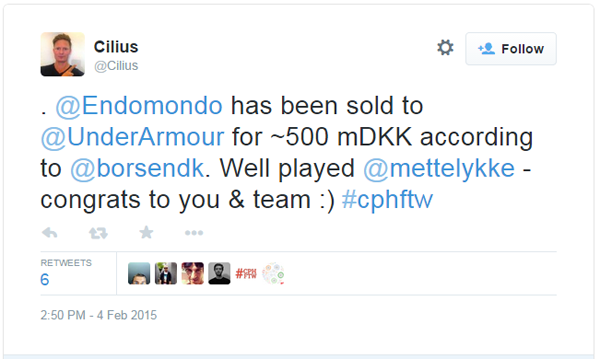 Yesterday a deal was apparently made and Endomondo is sold to , a sports apparel manufacturer. I sincerely wish Mette and hopefully a bunch of others who made a sizable chunk of money congratulation. It’s certainly well deserved. This entry was posted in Running and tagged endomondo, underarmor on Thursday, February 5, 2015 by Martin.